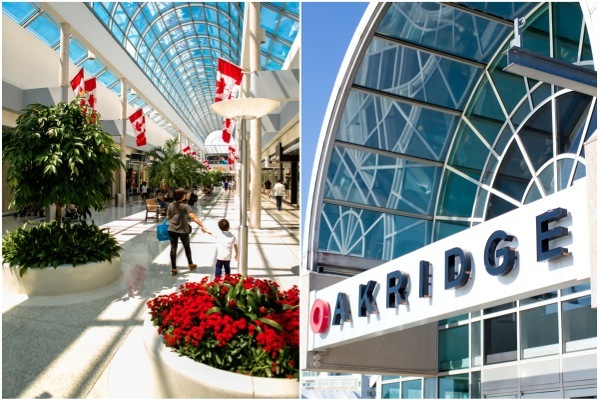 Some of the SHOPPING CENTER projects that we were involved in. 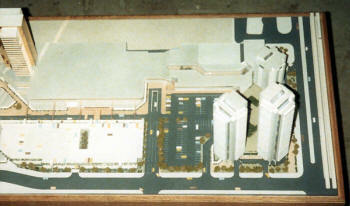 Above was a large scale model we built, to show what the mammoth skylight over the mall would look like when completed. 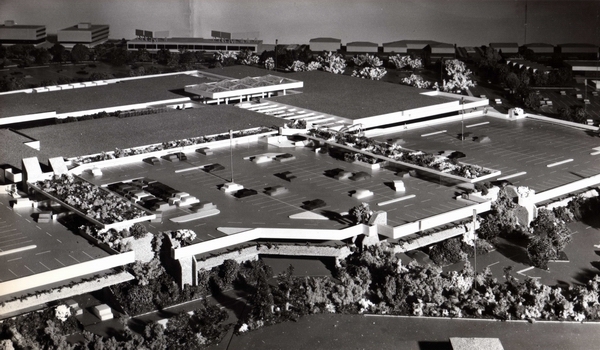 The model stood about three feet high, and showed in detail, all the glass panes, and steel structure that supported it, as well as the escalators and upper and lower level retail stores. 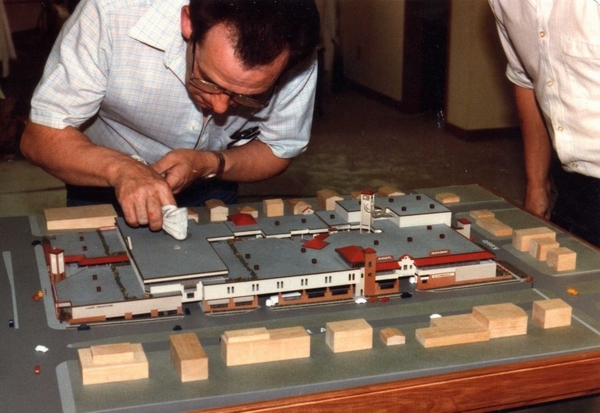 The feature trees in the model stood about two feet high, and were quite a challenge for my Brother Bob to custom build. 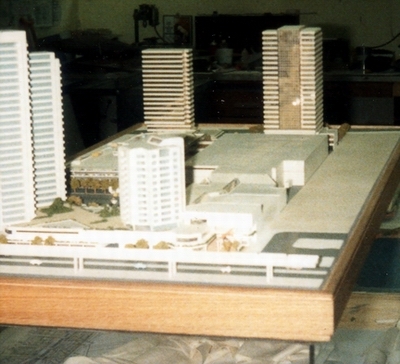 The view on the left, showed the originally designed skylight (not used), on the much smaller scale model of the complete site. 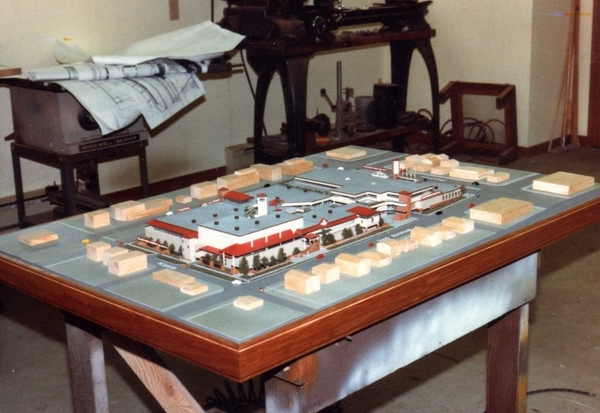 The site model I guess, was about twelve foot square. This was a long ongoing project that seemed to last forever. Initially built in our Richmond workshops, and later moved to the architects office in downtown Vancouver. 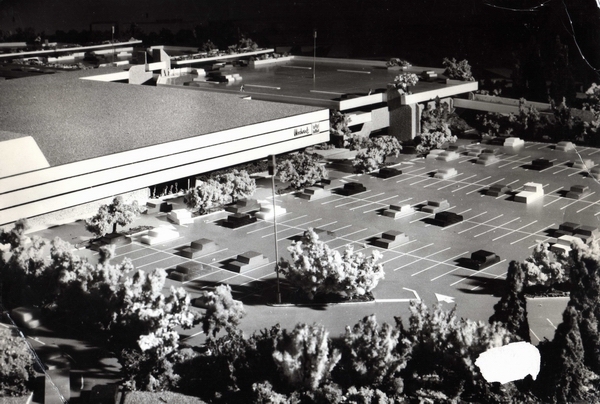 The major retailer was Woodwards, a household name in Western Canada for many years. 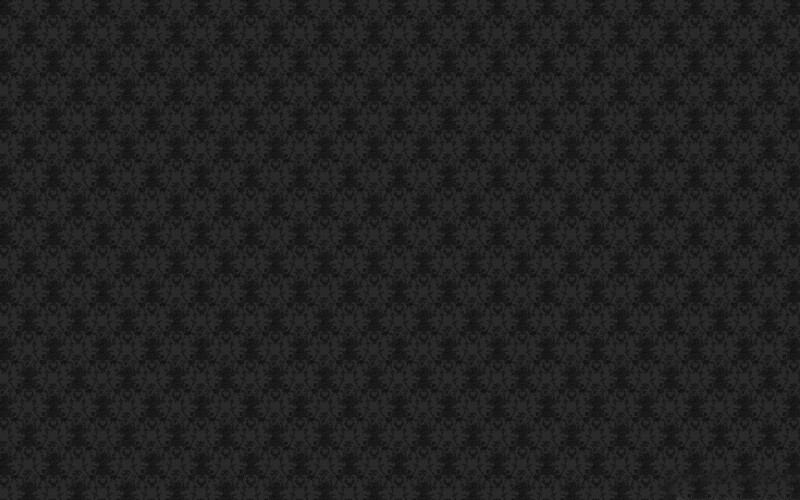 There were so many issues with traffic, and home owners and business surrounding the site, that took so long to resolve. Architects: Wade Stockdill Armour and Blewett. The picture on the left is one of my favorites. It brings back so many memories, showing my Mother, just in frame on the left, and my Son Barry, at the top. 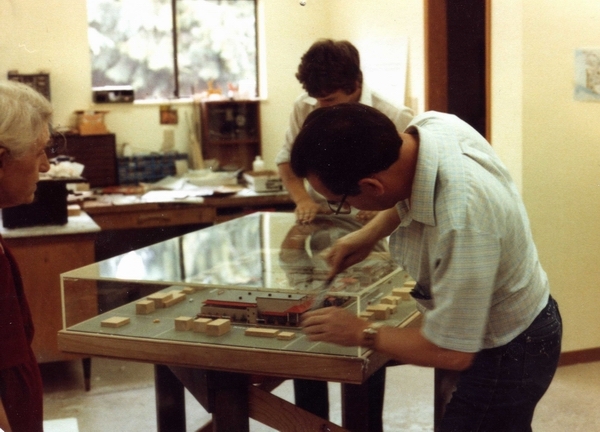 My workshop, was a detached building, at our residence, and on many occasions, my Son and I would have to put in "all-night sessions", to complete models on time. This was one such time, about 6.30 am on the morning of the model's delivery. My Mother, a very early riser, living with us at that time, would see the lights still on in the workshop, and bring us all, tea and toast, knowing we had been there all night. Picture taken by my wife, who could never sleep when we were under pressure, at the end of a project. Very little is known of this model. It was in and out in a very short time, and was not very much more than a massing model. 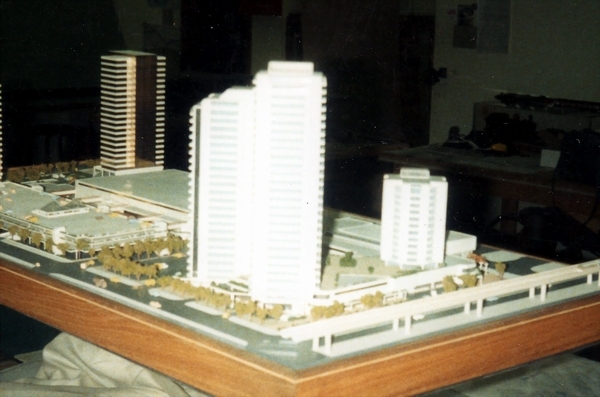 It was designed here in Vancouver, for developers in China, and was shipped directly to China on completion. 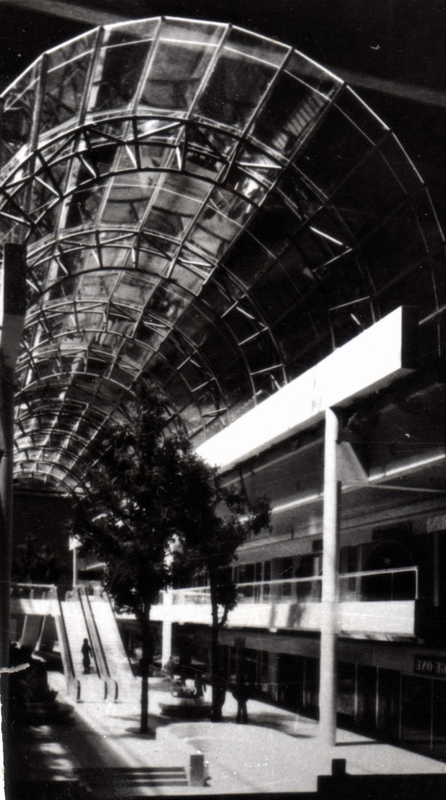 When Metrotown was first established it was a lot more simple than it is now. 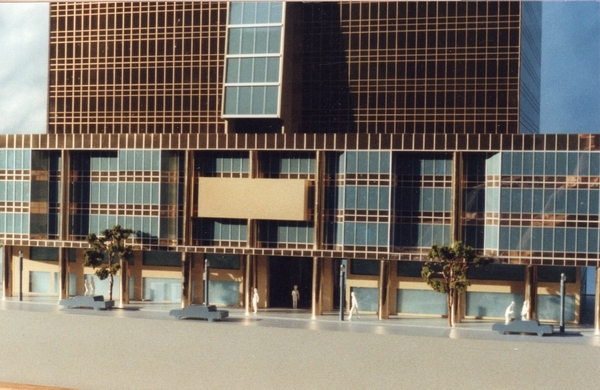 Many additions have been added since this proposal was made. 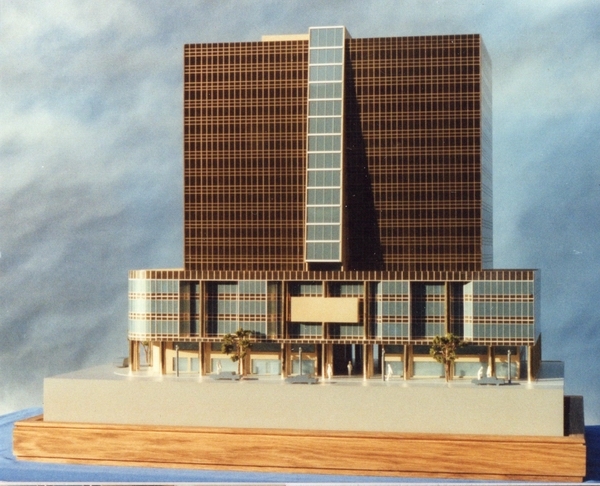 Rick Jones Architects was my client, who was responsible for the large gold reflective glass tower, and more.